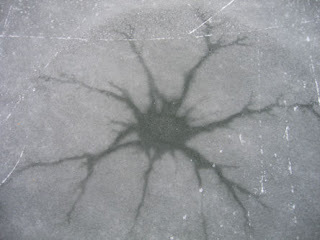 Such joy and mystery a frozen lake holds. The Princeton recreation department declared Carnegie Lake safe two days ago, and we managed to get out there before last night's snow came down, like a curtain on a fantasy play. 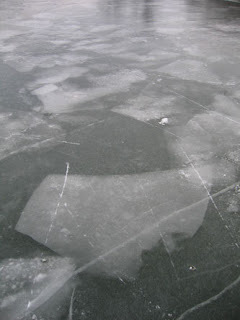 The ice was smooth in places, a bit rough in others, whispering its secrets to us as we skated from hither to yon and back again. There was the pleasure of joining the impromptu Skaters Without Borders club, of escaping the tyranny of counter clockwise motion imposed by all skating rinks, as if the whole population is incapable of turning to the right. 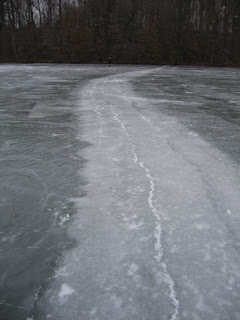 But most fascinating was the story the ice was quietly telling, through the language of its patterns, of how it formed. I have no idea how the ice makes eyes--those circles that look like a dark pupil with rays of the iris radiating outward. The others? My guess is that the white plates embedded in the ice reveal that the ice froze some weeks ago, then broke apart, then refroze, capturing the leftover chunks in the new formation. Snow then fell, obscuring the ice and preventing the township from testing the ice to declare it safe. 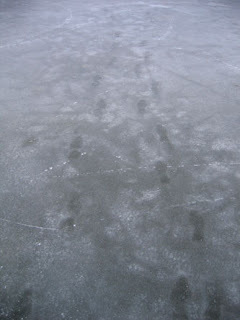 During this time, an intrepid cross-country skier and two hikers traversed the lake, leaving their tracks. When the snow melted on a warm day, the tracks melted differently than the uncompressed snow, then refroze. 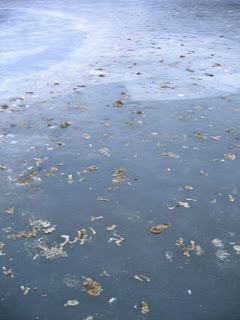 In other photos, a fish frozen in the season's amber of ice. A gathering of geese left their unmistakable traces. And broad lines traversing the lake give a mini-lesson in plate tectonics, showing where the expanding ice formed fractures. 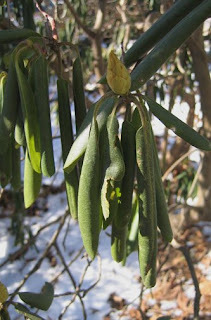 Most of the year, this evergreen shrub is an inexpressive green blob in the yard, but nothing says cold like a Rhododendron. When the temperatures dipped down into the 20s and teens recently, most trees and shrubs looked unperturbed. But all the Rhododendrons in town struck a compelling pose, telling every passer by what they already knew: "It's cold out here!" Spread the word. The township rec dept. has given the green light for skating on Carnegie Lake. 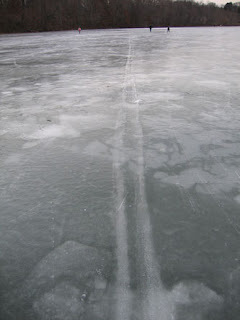 I haven't been down yet, so don't know how smooth the ice is, but that's definitely the afterschool destination. 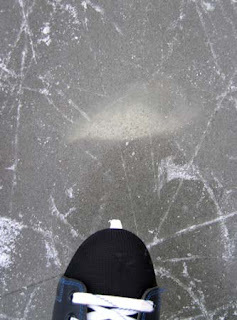 Here's the website where the township provides up to date info on skating conditions at three locations in Princeton: http://www.leaguelineup.com/welcome.asp?url=princetonrecreation.